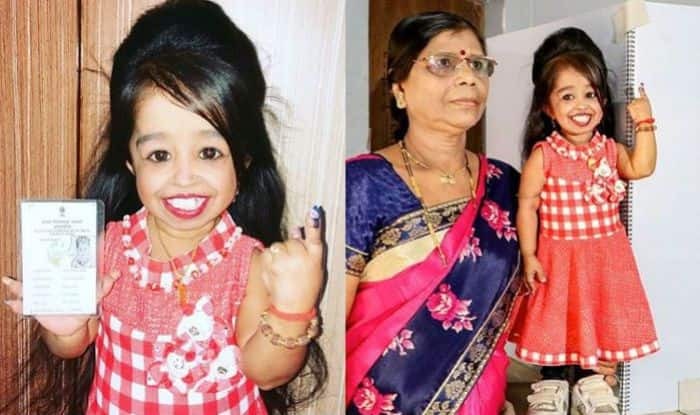 As people from Phase 1 Lok Sabha Elections are casting the vote today, the world’s shortest woman, actress and Guinness World Record holder Jyoti Amge also turned up to vote at a polling station in Nagpur on April 11. Jyoti, who stands just 63 cm tall, can be seen wearing a red and white checks sleeveless frock. As per the reports, the 25-year-old waited patiently in the queue waiting to exercise her right at the polling booth. Jyoti Amge came into limelight in 2012 at Bigg Boss 6 show. After giving the vote, Jyoti took to social media to share pictures of her inked finger. At the Nagpur poll booth, she was quickly recognised by the locals who greeted her warmly. She requested everyone to give the vote first before going to work. “I request all people to vote. Please vote first and then go to complete all your other works,” Amge told the media. For full coverage on Lok Sabha Elections 2019, click here.